Running is a moderate- to high-intensity activity that requires many systems in the body to work overtime to support the extra energy expenditure. Although this level of exercise has been proven to be better for you than no exercise at all, it may sometimes cause discomfort. Mild pain in the head and the nose after running usually is not a serious condition, but as with any pain in the body, it is best to seek the advice of a medical professional. During moderate to intense exercise, such as running, more demands are placed on the systems of the body. The respiratory system works harder to deliver more oxygen to the blood, and the heart pumps faster to deliver fresh oxygen to the muscles. Even the digestive system participates by slowing down to conserve energy needed by the muscles. As a result, it's not uncommon to feel aches, pains and discomfort in many areas of the body during exercise on a frequent or infrequent basis. However, any pain that is recurring should be checked by your health care professional, as it can be a sign of an underlying illness. Whenever there is pain in the head and nose, the sinuses are a likely culprit. Sinuses are air-filled spaces in your head that connect to your nasal passages and serve several purposes, including warming the air you inhale, insulating the eyes and nerves, improving voice resonance and protecting the face from trauma. Sinuses can become infected, causing a build-up of pus and pain and pressure in the head and nose. Symptoms of sinus infection may be mild or severe. Some people suffer from chronic sinus infections, which may be worsened by running. If you think sinus pressure may be the cause of your pain after running, see your doctor for a diagnosis and treatment plan. 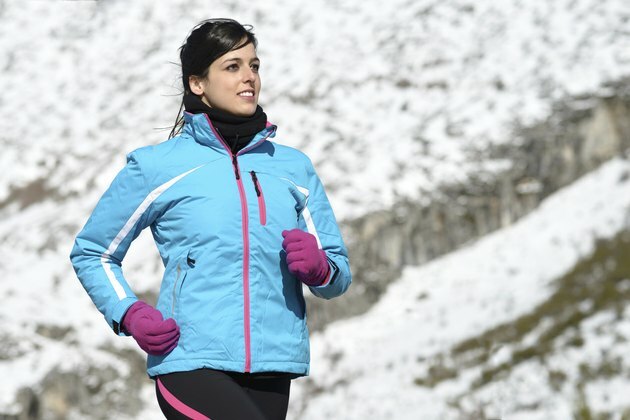 Running in cold weather can be uncomfortable. Breathing in icy air may cause pain in sensitive nasal passages in some people. Cold air also is drier, which cause sinuses to dry out, bringing on sinus pain and pressure, headache and pain in the nasal area. If your head and nose hurt only when running in cold weather, take precautions to protect yourself from the elements -- wear a hat to trap body heat and, if temperatures are very cold, consider wearing a a protective layer over your mouth and nose to avoid breathing in icy cold air. At home, keep a humidifier running to add moisture to the air, which will help keep your sinuses healthy, even when you're not out on the trail. Other causes of pain in the head and nose while running may include chronic migraines, dehydration, fatigue, high blood pressure or other underlying conditions. Most mild headaches after running are not serious and are a result of the dilation of blood vessels inside the skull. However, more severe headaches and pains, or those accompanied by nausea, vomiting or blurred vision, should be checked by a doctor, as they can be a sign of a serious condition. FitSugar: Is Cold Weather to Blame For Your Pain?